In the same way that a variety of languages gives texture to a world, so too does a variety of ways of writing within a single language. Typography, at least in the West, varies slowly over time. And this long trail of changing taste in fonts, this comet-tail of letterforms, is documented in our signage and inscriptions. Any city of reasonable age has an entire linguistic and stylistic history embedded in its street signs, house numbers, and obsolete advertising. It creates a visual richness, and forms a tacit confirmation of age and permanence. These places use typography to show us their past, in finest storytelling tradition, rather than having to tell us that they’re old. By contrast, we generally see a real typographic poverty in visual SF&F. Alien languages will have only one font, usually in only one weight. Humans, particularly in science fiction, will either use one or two special futuristic (and frequently unreadable) fonts, or pretty much the same range that we use now. To the typographically aware, both approaches underline the shallowness of the visual worldbuilding. 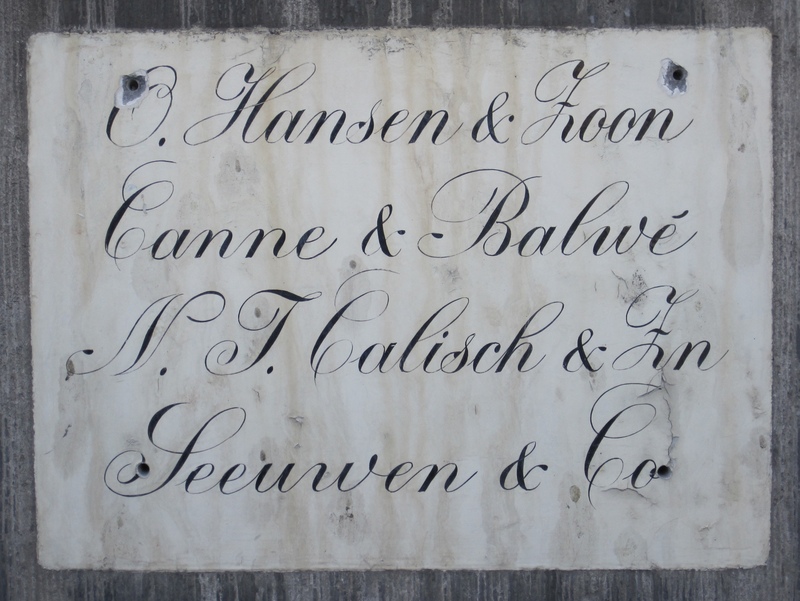 Now, it’s true that many of our fonts have historic antecedents (Trajan), or are a century or more old (Goudy). But every generation seems to add one or two more into common usage (Gill Sans, Helvetica, Calibri…). I’d expect a future society to use many of our extant fonts, plus one or two reasonable-looking but unfamiliar workaday additions. 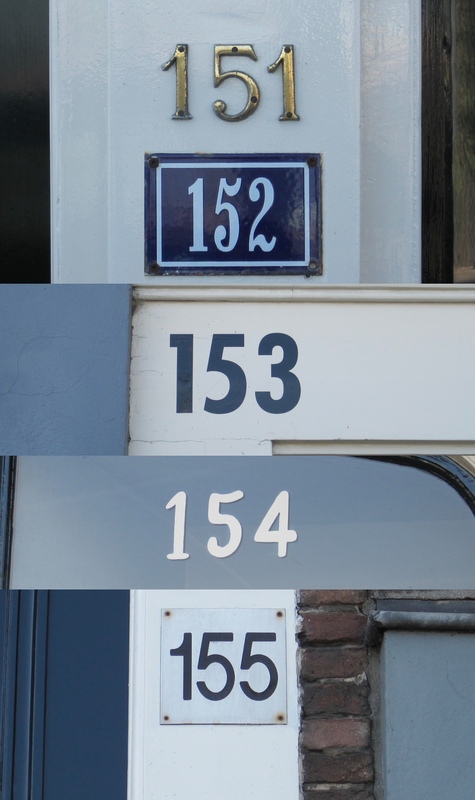 Note that all of the photos in this post were taken on a single block of Prins Hendrikkade in Amsterdam. I wonder how much the ‘typography’ of Asian pictograms has changed over time. All of which is just a roundabout way of saying that there is such a thing as typography of Chinese characters, and that quite certainly it has changed over time. While I don’t speak Chinese, I do purchase fonts on a regular basis and so I know that there are many, many varieties of fonts in other languages. As many as English. Styles of typography in all languages have changed over time and it’s very clear when you look at them side-by-side. Along the same lines, think of how interiors are decorated in SF, both filmic and in story. If you’re in the future then everything is assumed to be “futuristic.” Yet here I am sitting in the future, with a laptop on my thighs, an iPod on a Mission style file cabinet across the room across from an IKEA bookcase cattycorner to a family heriloom dresser. And there’s a bunch of cheap junk here and there along with other fancy electronics because I love electronic gadgets. But this kind of real-life random richness doesn’t seem to show in SF portrayals of future scenarios. Yet I think that in a hundred years, much like with typography, we will continue to pull bits and pieces of the past along with us like Marley’s chains. In reply to David Goldfarb’s #2: If you ‘search inside the book’ on Metamagical Themas on Amazon for the string ‘latin alphabet’, it brings up those two pages. Amazing. Elizabeth Bourne @4: It was really amusing five or six years ago to watch a brand-new future-set SF series and count off every single item in the character’s quarters that are currently purchasable at IKEA … pretty clear where the prop coordinator went shopping. Remember the futuristic font used on signs in “Space: 1999”. I think the movies where the Future becomes dated less quickly are those that do remember that, like you said, we carry Yesterday along into Tomorrow. One example would be “Bladerunner”. I did not know, and was too tired to research, the variations in Chinese scripts. I’ve seen some variety in Korean typography (just in passing), and once spent a very interesting evening discussing Hebrew fonts with an Israel-born colleague. But my rule of thumb is not to make the assumption that cultures outwith the ones I’ve dealt with match the ones I’ve experienced, so I didn’t try to generalize from what I knew. I think Elizabeth Bourne’s analogy with interior decoration is a strong one, and nicely set out. And, as Serge points out, that mix of old and new (in both interior and visual design) makes “Bladerunner” one of the most convincing portrayals of a believable future. Hey, look! Here’s an article on linguistic and orthographic drift between Taiwan and Mainland China. One of the biggest differences is that China, starting in the 1950s, has required its people to use simplified Chinese characters to raise literacy. Taiwan continues to use traditional characters, which have more strokes, insisting they best represent the culture behind the language. There’s a chart with some examples alongside the article, and some discussion of the current perceptions of the two orthographic alternatives. It’s an interesting slice of information, even with the grain of salt one uses with sources foreign to the language they’re describing. Years ago, we hosted a Japanese foreign-exchange student teacher, and he left me his sumi-e calligraphy kit rather than pack it back to Japan with him. I chatted with him about writing and calligraphy, and in particular, tried to explain the Western interest in re-designing letterforms, and if there was a similar interest in Japan. He looked at me with some puzzlement. The cultural emphasis on both tradition and on beauty means that there’s a much stronger tendency to retain the “classic” brush-based glyphs. Now, having since visited Japan, I know that there’s definitely a Western-style culture of advertising as well, and I’m sure that’s driving glyph simplification and differentiation, but I would be astonished if it were anywhere near as varied as the Roman alphabet has experienced. Also, a few years ago I had the opportunity to spend a couple weeks in Korea, and I very much enjoyed studying the letterform variations of Hangul. In fact, I picked out two specific syllabic glyphs, “een” (안, although my Mac says it’s “an”) and “ju” (주, although sometimes I found “jo”조 instead) , and took pictures of them every time I spotted one. I have about 30 pictures of each. I would love to see those photosets. They sound fascinating. Looking back at my pictures, I can see that I also sometimes included “in” (인) when I thought I was seeing “een/an” (안). There’s also a very strong cultural component to typography—signage in the UK feels very different than signage in the US; in particular, the UK leans towards snazzy sans-serifs everywhere, whereas in the US it seems like there’s a wider range of typefaces in use, with lots more serifed faces. Your wish is my eventual-get-around-to-ed-ness. Dave @14 That’s really fascinating. I’m in the process of learning to read and write Japanese, and sometimes the kanji can give me fits because it’s not very clear to me exactly which bits of the figures are important for distinguishing them. Sometimes what seem like big obvious differences aren’t terribly important, while what seem like minor differences can completely change a meaning. The Wikipedia page on Chinese characters looks pretty good to me; I also found a nice “historical procession of Chinese characters chart here. I randomly wandered over to this page on modern Japanese script variations: quite neat. It’s strange; I definitely look at them and think, yep Japanese. I couldn’t say why. Chinese fonts even have their Trajan analogues: standing stone pillars with books engraved on them, so anyone could come by and make rubbings or ink prints. Dave Howell @ 14: That’s a great gallery. I now have a new hobby for when I travel. Jay Lake @17: Interesting. She took Abi’s suggestion that visual-media SF should have more than one typeface visible on signs and commemorative t-shirts and documents or whatever, and took it as a slam at her as a book designer of *written* SF, which I’m pretty sure wasn’t mentioned at all … hrm. I agree wholeheartedly with Barbarienne’s comments about future fashions being kind of boringly unimaginative (and very tied to the trends of the time the thing was written — see also Logan’s Run). That being said, I preferred Jenny Agutter to Farrah Fawcett. I haven’t done a very good job of configuring alerts, so thanks for the pointer. I stopped by her place to write back, as much because her comment on fashion in SF made me think of a reasonably good example (the clothing details in China Mountain Zhang really work for me as scene-setters) as for any other reason. As Elliott says, I think she rather got the wrong end of the stick from what I was trying to talk about, which is the presentation of typography in visual media. In particular, there’s a huge difference in audience between the viewers of a TV show/film, who want things to be as realistic as possible, and potential book buyers, who want to be able to get an idea what the book is like when the see the cover. I’ve listened to TNH talk about book design and signaling enough to understand the complexity inherent of that side of the business. It’s a completely different animal than realistic worldbuilding in SF. And thanks for the kind word about the blog. It’s very new, and I’m still finding my feet with it; that sort of encouragement really helps. That’s just exactly as hypnotically cool as I had hoped it would be. Thank you very much for putting that up. My daughter became obsessed with writing before she learned to read (it’s not uncommon). She copied a lot of letters out of books and off of signs without much understanding of which elements of them were significant. Fascinating to watch. Abi@21: I’ve never had anybody around who seemed like they’d be interested in that gallery, which is why I’d never gotten around to publishing it to the web. It was a lot of fun to go on the typographic treasure hunt while I was there. I think any attempt by visual artists to attempt “future typography” is a mistake. Anything I create now to look all “future-y” cannot help but be a reflection of my own design context. And of course they’ll have more than one font in the future. Any attempt to make type ‘futurized’ just draws attention to it, and if drawing attention away from the characters, dialog, and plot isn’t a bad thing, then it must be a fantastically terrible movie/show/thing. I think it was Rick Sternbach, many many years ago, who talked about working on alien fonts for StarTrek:TNG. They would make up a weird font, then, for fun, map the glyphs to English letters, transliterate some message, and display it on screens. Unfortunately, it turned out this completely defeated the purpose of making the alien writing in the first place. Most of the time, alien text on screens was in the background, and unreadable, and if they used the script to code something in English, then, at a distance, it simply looked like something in English on the screen. Word size and spacing became the recognizable characteristics, and English has a ‘rhythm’ that is different from German or Farsi or Hangul. I thought that was absolutely fascinating when I heard it, if retrospectively fairly obvious. Another related datapoint is that some years ago, I bought a beautiful blank book; a monster tome bound in leather over wood board covers. It just screams “Spell Book.” It came with about three inches of letter-sized parchment paper bound within. Of course, what I really want is to have it full of magic, but covering page after page with hand-written instructions for newt-eye soup seemed Sisyphean. So I decided to create some magical-looking fonts and make my computer generate page after page of magical nonsense. In the process, I have learned many fascinating things about what it takes to make something look meaningful. I have pointedly NOT attempted to map English or any other language into these fonts, because of the cautionary tale above. However, just selecting glyphs at random makes for a page that looks, well, random. Meaningless. On the other hand, human eyes excel at pattern-matching. Think of those ‘ransom note’ fonts. As soon as you see the same letter “S” appear twice, the illusion of a ‘real’ ransom note is lost, and you can spot those identical letters in a flash; human brains are designed to do that. So my mystery magic fonts have to provide repetition to create a rhythm and the illusion of intention, without giving away the synthetic nature of the exercise by allowing the reader to spot any duplications. The result is that none of the ‘fonts’ have been (or can be) defined in a standard font file. Most of them are blocks of Ruby or AppleScript that, when run, generate PostScript, building a page a stroke at a time in order to include the variations that are inherent in hand-written work. Most of the code goes into controlling how often a particular patten re-appears. I’ve been working on this project for well over a decade, and it’s been really fascinating to discover these abstracted facets of writing. I am hoping to actually present some pages of these fonts as broadsides at WorldCon this year, btw. Abi, thank you for another thought-provoking post. Love the blog. When they were filming the movie “Alien Nation” the turned about 6 sq blocks into the ghetto the aliens lived in. The signs were all in some alien script. It was pretty believable. It may just have been the scale (the covered pretty much every surface with signage, posters, flyers, etc.) and that the set was so large that real people were allowed to just wander about, but I didn’t have the feeling that all the lettering was the same font. If it wasn’t I’d guess the sheer mass of material they had to produce meant using more than one printer, signmaker (I don’t recall if they did any in neon, that would have required a different style of type), but it had a fair bit of verismilitude; We were wondering what part of town we’d wandered into,because it didn’t look right, but it didn’t look wrong. You know by now how much I enjoy the products of your creativity. I won’t be anywhere near Worldcon this year, but I’d love to see images of anything you’re showing off there. Back in high school, I and my best friend (who, in one of those weird coincidences of which the world is made, is Liza Groen Trombi, now She Who Must Be Obeyed at Locus) invented our own alphabet. It’s mostly a letter-substitution for the Roman alphabet. I later created a cursive version of it on my own. Liza has, I think, forgotten the script, but I still use it for private notes and password prompts. Every now and then I’ll write out a page or two of it and enjoy how different the rhythm of a different script is. Heh. Flashing back to my own abortive attempts at Alien scriptage. Recently, I ran across a sketch I’d done some years before, and realized with a blink that the core wordform that had been trying to burrow its way to the surface of my consciousness was the glyph for om. That’s a shame because Reno is only a 4-hour drive from the Bay Area. Cythia W @15: I remember that same difficulty when learning my hiragana, in Japanese. (Katakana were much easier, with all those nice sharp angles.) I couldn’t always tell what was a vital part of the character, and what was a bit of serif-ing or what not from the font. And, actually, I had the exact same trouble with Greek lowercase, when trying to learn ancient Greek from textbooks. I wanted to be able to write Greek myself, but I wasn’t about to be able to replicate the ‘standard’ font used, but neither could I tell where a blob was serif, and where it was actually a disguised tiny loop or hook. What actually helped enormously was finding a book that laid out, on a nice set of lines (with that dotted line down the center that many of us remember from first grade writing exercises), stroke directions for writing all the Greek letters, uppercase and lowercase. It was suddenly clear what each part of the line was doing, and what mattered. Similarly, hiragana got a lot easier when the professor started doing big, slow examples on the board, explaining where the turn should go, what was supposed to be a sharp angle or a curve, and so forth. Dave Howell @31: Alas, while that is marvelously succinct, it doesn’t actually explain the matter at hand: specifically, why the most common appearance of the letter in fonts when printed doesn’t match the version we teach children to write, unlike every other lowercase letter. They’ve all gone through various mutations at times, but that’s the only when there that distinct difference seems to be sticking. I don’t think I understand the question, although that may be because your statement contains assumptions that are demonstrably untrue. The “most common appearance” of lower-case A is not obvious to me. Most seriffed roman fonts use the loop-and-hook, but nearly all italic fonts, and many sans-serif fonts, use the style more commonly used when handwriting. Also, it is not true that the roman serif version of every other letter of the alphabet is the same as the hand-printed version. You apparently were quite traumatized by the letter “a”, but blithely ignore the far more dramatic differences of the “g”, of which there are at least 3 different forms all in wide usage. The lower-case “t” of seriffed roman fonts never looks like a crucifix. K, k, Q, y, and f also have distinct variant forms that remain solidly represented in contemporary usage. Personally, I adore the two-hoop “g,” and almost never write the ‘standard’ g (which is roughly an “o” and a “j” pushed together). Boring. Thankfully, after years of neglect, the notably superior lower-case numerals have made a strong comeback, as well. My daughter learned to read this academic year*. Her class studied the alphabet letter by letter in the autumn, learning the sounds and practicing writing. Then she went through a period of profound uncertainty in January and February. We talked about it. It turns out that, although she knew all the letters, the variety of forms that some of them could take gave her the feeling that there might be some other letters out there, lurking, that she simply had not yet run across. The feeling went away when she had read enough books in enough fonts that she stopped hitting g’s and a’s that she couldn’t immediately recognize. * Though she could sound words out before, she didn’t want to call it “reading” until she’d been Officially Taught. Abi… Does it mean she now actually reads “Girl Genius” instead of making up her own stories to go with the pictures? Me, I first practiced my reading skills with “Buck Rogers” and it’s been downhill since then. Dave Howell @33: I wasn’t so much “traumatized” as found it peculiar and poorly explained by the adults in my life. The discrepancies between other letter transcription seems much lower to me than the difference between those two. Possibly my brain just doesn’t parse hook -> loop as significant in the same way presence/absence of a new hook overhead. I confess, though, that being told I’m making “demonstrably untrue” statements, when speaking about my own observations of the world, is sort of distressing. The fonts I usually use, usually use a particular type of lowercase letter, which looks to me in a certain manner. I’m…not really sure how that can be demonstrably untrue. Do you mean that it’s not universally true, because other people tend to read/use different fonts? I’m sorry if I gave the impression I meant “everyone” when I was just trying to talk about my own experience. I regret having phrased my statement in a way that has caused you distress. However, the phrase you used did not restrict itself to ‘your own experience:’ “why [the common hook-and-loop ‘a’] doesn’t match the version we teach children to write, unlike every other lowercase letter.” I was not trying to say that this isn’t true for other people, I was, in fact, trying to point out that it isn’t true for anybody*, including yourself. I was unable to find any font in my collection that had the non-handwritten-style “a” that did not also have the non-handwritten-style “g”. There probably are a few such fonts out there, but nowhere near enough to make the two-loop ‘g’ an outlying exception. Ah! I see the disconnect, then. When I look at the variants described between the various lowercase letters between fonts, to me, they all do look like the version I was taught, or near enough to pass without comment. All of the other differences you mentioned read to me as small stylistic variations that don’t look different enough to register as significant divergence. When I look at printed-a vs. serifed-a, I see a Significant Variation. When I look at looped-g vs. non-looped-g, it just doesn’t read to me as a Significant Variation. Not sure I could really explain well why without trying to create images, though, so I’ll just chalk it up as a personal quirk that my mind divides those sets so differently than yours does. Between languages and typography, there’s an intermediate step that also needs to change over time and across cultures, involving assumptions and background knowledge and such. For example, it’s common to have the raw language skills to read, say, Persuasion or A Deepness in the Sky, and yet many people won’t get anything from either book, because they haven’t got the underlying picture of the world to make it make sense and be fun to read. Similarly, reading political and legal writings from the 1780s probably requires understanding quite a bit about the conventions of speech (“Nature and Nature’s God”), assumptions, etc. The problems with typography and even language can often be overcome by an occasional Rosetta Stone like set of documents–translations that let modern people go from Spanish to Latin to Greek or something. But the problems with understanding the mindset of the writer of some document several hundred years back is probably much harder–it probably requires knowing a lot about the history of the time when the document was written, and especially a large set of other writings from the same time so you can note shared ideas and assumptions. albatross @39: But the problems with understanding the mindset of the writer of some document several hundred years back is probably much harder–it probably requires knowing a lot about the history of the time when the document was written, and especially a large set of other writings from the same time so you can note shared ideas and assumptions. My goodness, yes. Two years of Latin, and I still find myself baffled by the assumptions in a lot of the texts I’m translating. And that’s with a lot of extracurricular reading on the time period, footnotes, and lectures from the professor, not to mention Roman culture being a remarkably thoroughly researched ancient culture, compared to some. It’s useful, though, as a constant reminder of just how much cultures vary, whether across time or space.